Welcome to Bakers' Ink and Branding Parlor! As if the pictures don't say enough! The Baker family has a sick and bizarre obsession with San Jose Mexican Restaurants. As most of you know, we more than frequent them. Sam and Fulton get excited over more than just the food though...it's the tattoos after they finish eating! 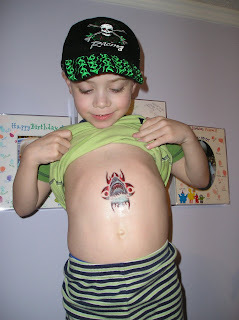 They each get $.50 to put in the machine and get the tackiest tattoo $ can buy. So when we get home the "reward" for taking a speedy bath without drowning or beating each other is the application of the tacky tattoo. 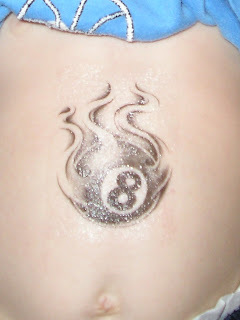 Trust me...you don't even want to be in the same state if one of them doesn't get their tattoo!!! They think it is the greatest thing. 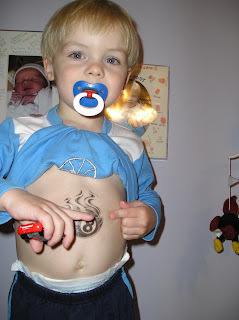 I'm surprised no one has called DSS on us for the inappropriate symbolism of the tattoos on our young children. It is so hilarious to see Fulton running around with a rose and dagger stamped on his arm. He could truly be the youngest member of Hell's angels. And Sam thinks his are super cool too. Hot dang, Sambo!!!! That's a purdy nass shark ya got thar! And to top it all off LITERALLY...check out the hat! 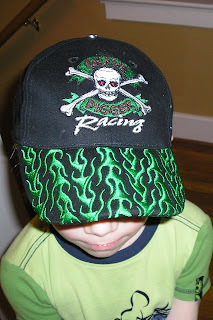 went into a full-fledged fit...so badly the Gas Station attendant ripped the tag off and gave him the hat!!!! It hasn't left his head yet and he even slept in it!! A bappy and a new tattoo...Fulton's dream come true!